It’s important to understand the link between stress and ovarian cysts. These days it seems that it is normal to feel stressed out. In fact, most of us wouldn’t know what to do without the hustle and bustle associated with our daily lives. A life filled with stress can lead to many health problems. If one does not learn to control the stressors in their life health conditions such as ovarian cysts can worsen and become life threatening. So what does stress have to do with ovarian cysts? Chronic stress can cause the body to release more estrogen and less progesterone. High levels of estrogen can cause one to be on edge and irritable and can cause you to feel unfocused and foggy. On the other hand, progesterone can have a calming affect on the body, enabling one to have a clearer mind and to be more focused on the task at hand. This hormone imbalance can cause irregularities in ovulation and can even cause your body to not ovulate at all. 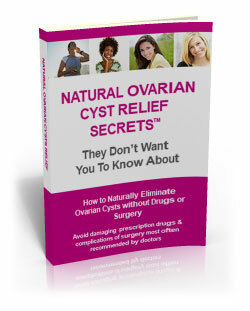 This can contribute to the development of ovarian cysts and can worsen over time if the stressor is not relieved. - Dedicate at least 30 minutes a day to doing whatever gives you the most enjoyment. It may be reading a book, taking a walk, having coffee with a friend, or simply doing nothing while your husband picks up the kids from daycare. Whatever it is, doing it on a daily basis will greatly reduce your feelings of stress. - Exercise at least 3-4 times per week. Exercise releases endorphins as well as several other happiness inducing hormones into your body. This can cause a feeling of wellbeing and general happiness. In addition, exercise can help you release built-up tension. Some women suffering from ovarian cysts may have difficulty with certain types of exercise due to severe pain from your ovarian cysts. Ask your doctor what would be an acceptable exercise routine for you if you have difficulty with activity. Some exercise is better than no exercise when working to reduce your stress. - Take a slow deep breath. There is a reason that those who regularly practice yoga are generally known to have a peaceful and calm sense about them. Yoga utilizes slow, deep breaths in addition to stretching which allows one to release tension from the body and decrease stress, thus reducing the risk of ovarian cysts. Reducing stress is not a cure for your ovarian cysts. However, it can help you control the severity of your ovarian cysts, thus reducing the risks and complications involved.